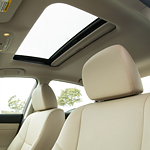 Nissan makes it easy to customize your Altima to fit your exact personal preference and needs. This popular midsize sedan comes with the option of adding a variety of genuine Nissan accessories and parts. The Nissan experts at Lithia Nissan of Medford are well-equipped to show you how you can personalize your Altima with our wide array or accessories. Nissan offers a myriad of accessories to choose from, including the premium 17-inch aluminum alloy wheels. Featuring a 5-split spoke design with recessed lug nuts, these factory-installed wheels will take your Altima to a whole different level of style. The external ground lighting system turns on when you activate the key fob, press the entry button, or simply just open the doors of the Altima. The lighting system fades in and out with the dome light and also features LED lights strategically placed between the front and rear tires for maximum illumination and security.